John Kitzhaber, 63, served as Oregon’s governor from 1995 to 2003 and in the Oregon Senate from 1979 to 1993. A trained physician, he is the director of the Center for Evidence-Based Policy at Oregon Health & Science University. Judy Peppler, state president of Qwest in Oregon: What is the source of the fire in your belly to run again? There’s a huge opportunity embedded in the recession. Oregon is heading toward California in being a state that can’t operate in the public interest. We just went though an extremely divisive ballot measure that left deep divisions between groups of people who have to come together to solve any of the systemic problems. When I was governor before, you couldn’t get people to agree on changing systems and structures because there was plenty of money. And now we have no money for what is a very, very profound fiscal challenge. There is a tremendous opportunity for fundamental transformational change in how we deliver public services. At age 62, there is no reason for me to do this unless I really believe that I can broker some significant structural changes in how we operate state government. Karla Chambers, co-owner Stahlbush Island Farms: Let me follow up. We’ve now got businesses running for the border because we have such an uncompetitive taxing situation here. What would you immediately do to shore up businesses to stay here? First, we have to change the conversation. It was very unfortunate that Measures 66 and 67 ended up on the ballot. I do not believe that they couldn’t have been brokered. Once on the ballot, it was a Hobson’s choice. I voted for them. But it was a stopgap, not thoughtful tax reform. There’s broad concern about the impact it will have on angel funding for new start-ups and on the philanthropic community. The capital gains portion is having a big impact on high volume/low margin businesses. The conversation has focused too much on high-income people on one side and the public employee unions on the other. The very first step to changing that is to change the conversation even during the campaign. We need to have a broader view of the tax structure and how we have a deep reserve fund. The tax code needs to be aligned with the objectives we want for Oregon’s economy. If we want to stabilize the tax system, we need a broad middle ground. Maria Wulff, executive director, World Affairs Council of Oregon: Your opponent, Bill Bradbury, went as far as to say he’d work to advocate repealing Measures 66 and 67. Would you go that far? I wouldn’t just repeal them. That’s piecemeal tax policy. We have a tax code that has been accreted together over time without thoughtful consideration of (a) is it equitable? and (b) is it sustainable? Which it clearly isn’t. And © what kind of incentives and disincentives do we want that tax code to reflect? So if you want an environment where small start-up companies can get the initial funding they need—and a lot them can’t even get to second rounds or venture-ready because they are not capital-ready—where’s that going to come from? If it’s going to come from deep-pocket Oregonians, then we need to create a revenue climate that’s going to reward that. Measures 66/67 are a distraction. Orcilia Forbes, educator, chair of Meyer Memorial Trust: Some of Oregon’s university presidents and higher education board members have asked for a change in governance—in essence, a public corporation model. Would you encourage that? I would like to put that in a wider context. No matter how good your post-secondary system is, if you can’t turn out qualified, highly motivated high school graduates, you haven’t met your workforce development needs. I have a bold higher-ed proposal: it starts with trying the very broken, highly siloed model in which the Board of Higher Education develops Oregon universities’ budgets over here, and over here the State Board of Education develops the budgets for the community colleges, and K–12 is locked in state statutes since 1992 where we reimburse by enrollment, not even attendance—think about that for a minute. The heart of my proposal is to abolish that budget scheme and replace it with a unified, transparent, performance-based budget in which we stop funding institutions and start funding students by performance measures. This new body, which I’m calling the Oregon State Education Investment Board, would create that unified budget. Chambers: When I was on the faculty of Oregon State University in 1990, for every dollar I had to allocate 19 cents for “Other Payroll Expenses.” Today, it would be 52 cents. For every dollar we pour into public services, that’s the overhead. That’s health insurance and retirement. Now that I’m in the private sector, 59 percent of my earnings go to taxes—federal, state, county, local. How are you going to control that overhead cost? The cost of insurance premiums reflects the cost of delivering medical care. Congress has been arguing health insurance reform, not health care reform. I’ve made it very clear that I do not support fully paid health care benefits. I call it value-based cost sharing. It’s based on not simply using co-payments and deductibles to shift out-of-pocket costs to employees, but to create incentives for them to buy high-value health care. So, you might not have cost sharing for screening for diabetes or breast or cervical cancer. Without those, you push huge costs downstream. But there’s a huge group of services in between. Let’s say you want surgery for lower back pain. Well, there’s no real medical evidence that suggests that surgery is more effective. So maybe there’s a 50 percent co-pay. So I would advocate value-based cost sharing and incentives for lifestyle choices. You can create a dual approach to reducing costs. The other piece is the pension system. There are two parts: a long-term question of solvency and dealing with the short-term cash flow. Benefits are going to be part of the discussion. Chambers: Should we really have state employees retiring with full benefits in their 50s? We in the private sector don’t see that. We need to look at that whole issue. If everybody in the country retires at 60, we’re in real trouble. The 65-year retirement age was created by [Otto van] Bismarck for his troops—when the average life expectancy was 48. We have to ask that larger question. The Public Employees Retirement System and health care need to be looked at in the overall context of a compensation package. People deserve retirement. If we don’t give them health care, they’ll just end up in the emergency room. We need to take a holistic view. We don’t solve the problem by beating up public employee unions anymore than we solve our tax problems by beating up on the business community. We’ve got to be partners. Forbes: I would support the restructuring of public education. But it will take legislative action. The current governor hasn’t been able to get many things through the legislature, even though they are of the same party. What will it take? Last night I was talking with some legislators. We’re going to have to create an Oregon diploma—one that actually means something—and if you get that, it means you can go to a post-secondary institution without remediation. You have to retain teachers. You need an administrator assessment tool. I met with a bunch of teachers after that; they were very reasonable. The opportunity is that we are going to face a $2.5 billion revenue shortfall in the next budget biennium. I wish it wasn’t true. But there’s no way to buy your way out of that. There’s no pot of money that’s going to fall out of the sky. We’re going to have to have a conversation. What I learned in my previous experience is that we’re trying to manage the state budget with a two-year horizon. What business does that? We need a six- or eight-year budget frame, and then we need to have those difficult conversations in that context. Peppler: The best way to solve that problem is to have more people working and paying income tax. What’s your strategy to create jobs? There are sectors that are still hiring: welders and some trade positions. There’s need for people in the health care field. We need to connect community college training to low spots. There are obviously significant opportunities in weatherizing and getting into very sick forestlands that are just waiting to burn—that could get some mills working and create biomass production. Long-term, we need to turn the Oregon Business Plan—which is a very good blueprint—into an action plan rather than just a discussion. But there are some things missing. The economic development plan I’ve put out has an element called Oregon to Oregon; it very intentionally creates local sourcing and supply chains so you create a more resilient web of business relationships. Miles Fiberglass & Composites is a good example that used to provide fiberglass to Monocle Coaches. That market dried up. Now they’re producing it for windmills and streetcars that Oregon Ironworks is building. We need to create some traded sector industries that aren’t reliant on durable goods. Oregon is very well positioned to offer a whole new set of products that add market value both domestically and exports based on green technology and knowledge-based exports. Chambers: For every job we create that pays over $100,000, Oregon is going to take 11 percent. If we move those businesses to Washington, there is no income tax. Oregon is at a clear disadvantage. How are you going to shore that up immediately? The short-term solution is that it has to be addressed in the legislature in conjunction with creating a rainy day fund. The second step—if we’re successful in creating the necessary broad middle ground—is to reduce our overall reliance on an income tax. One option is clearly a sales tax. I’ve been up that mountain a couple of times. We tried it under Governor Atiyeh in 1985 with a very well-crafted measure and only lost 4–1 as I recall. There was a less well-crafted one in ’92. But the problem is, there was never a context. It was always a debate about a tax, which is never easy. But now you can make the argument with a very straight face that the reason we have such volatility in our tax system, why we can’t provide stable education funding, and why we have eroding per-capita incomes is due to our narrow tax base. So if you’re trying to create an economic transformation context for this, we’re going to have to change the tax system. Relying on personal and corporate income tax for 90 percent of our revenue doesn’t make any sense. Wulff: In many of your proposals, you talk about a longer horizon of 8 to 10 years. Our legislators are on a 2-year cycle. How do you break through that? You have to create the tools. As long as we cling to a biennial budget, there is no context for that conversation. In order to manage your way through this revenue picture, you have to take the long view, a rational way to cut the budget. I don’t need statutory authority to present a budget that’s framed completely differently. Wulff: What does kicker reform look like to you? You capture the overprojection of revenue that would “kick” for an emergency reserve fund that has very clear metrics on how you can access it: a supermajority or some economic indicators. I would argue that it should be at least $1 billion. And then the thing kicks again. The idea is not to have a huge reserve, but to have something to prevent us from the thing that has been happening for 30 years—that when the economy drops out and the need for social services goes up, we ask people who are out of work to pay higher taxes. It doesn’t make any sense. Peppler: Did you propose creating a rainy day fund during your first term? I did in the ’97 session. The legislature didn’t just pass a bill to lock the kicker up, they put it in the constitution so I couldn’t veto it. 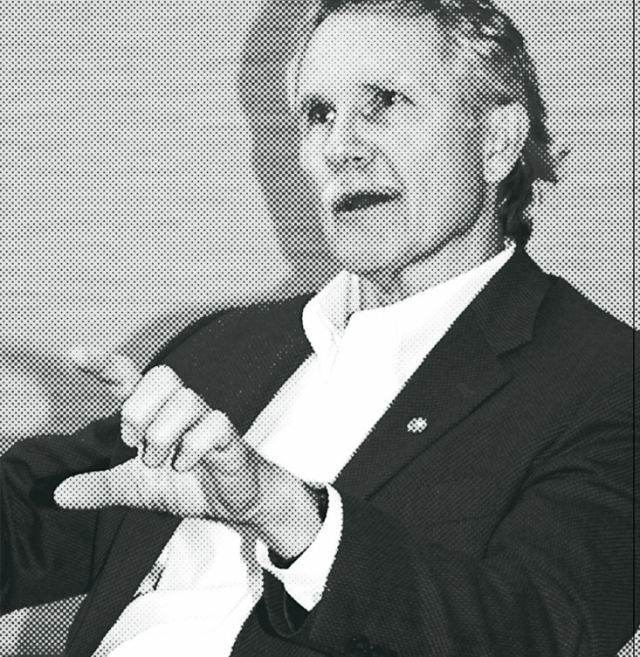 Wulff: What will it take to create a rainy day fund now? It will require getting the people who funded the Yes and No campaigns for Measures 66 and 67 together. Wulff: How would you do that? People have two options. They can leave Oregon. And some will. But there are a lot of people who can’t or don’t want to. So are we just going to give up on the state? Or are we going to say, “Look, let’s change this conversation”? I’m planning to use some of my paid media in the primary to do that. We need to see a light at the end of the tunnel. Nobody is winning. Chambers: Let me put the elephant in the room. Your income side is declining hard. Businesses are angry and looking at leaving. Your biggest budget driver is education. We now have 25 percent of our kids attending private schools. We have over 100 charter schools. Parents aren’t happy. How are you going to really control the cost side? You have to make the budget process transparent. The qualitative nature of the K–12 debate has not changed since I was a freshman senator in 1979. What you need to do is build more flexibility at the district level and at the building level for innovation to meet clear proficiency standards the state would set. You’d identify the districts having trouble and then go in to diagnose the problem. Then you’d provide support to get those kids over the bar. Step two, you have to create a teacher/administrator assessment tool that’s linked to student performance. If you increase transparency, you create accountability, and you can see what additional investments in education would mean. Chambers: Five foundations came together to fund this work. It’s already been done. But the teachers’ union shot us down and rejected exactly what you’re proposing. How are you going to bring the union to the table? My theory here is to be as transparent as I can be about the things that will have to happen. I want to be able to say, if you elect me, this is what you should expect. I want the teachers union to lead the change that has to happen. If you don’t want to, there’s Bill Bradbury. Forbes: The other kink in the armor is that the school districts have no local control. Measure 5 created that disconnect. What I’m suggesting is that the state sets the performance standards and you budget for performance. As long as you budget on enrollment, you will never get a different outcome. Give the districts flexibility. Obviously, it will take a statutory change. But if you talk to most teachers in the classroom who work incredibly hard, they know the system doesn’t work. There’s a lot of support. Chambers: I firmly believe vouchers and competition are absolutely key to better outcomes and accountability. Yet we have sheltered 60 percent of our budget away from [any accountability]. How would you use competitiveness to force the outcomes you want? I would not do it through vouchers. Public education—with a capital P—is the cornerstone of a democratic, pluralistic society. We all contribute to it whether we have kids or not. People who don’t have the ability to pay for private school and additional benefits have to rely on the public school system. You can’t just let people run away. They have to contribute to that floor. It’s the vehicle for opportunity. Having said that, there should be more competition through charter schools, through technology and Internet learning, but I would not support undermining public education. Pepper: What’s your position on the Business Energy Tax Credit (BETC) and the scenic concerns some environmentalists have? Oregon has created a Renewable Performance Standard that says that 20 percent of the utilities’ power has to come from renewables by 2025. They can make that, but there are trade-offs. But we lack a holistic view. I support BETC, but it’s gotten way out of hand. You have to measure tax credits vs. jobs produced. If you’re going to create a low carbon future, you have to be able to move the power from generation to where the load is. It’s not in southeastern Oregon. Transmission siting is something we have to come to terms with. Same thing with Liquefied Natural Gas (LNG). I have some big environmental concerns about siting LNG. But there’s some larger question we should ask first: what is the transition fuel? The fact is, a commitment to wind is a commitment to natural gas because you have to have reliability in the transmission grid. So what role does gas play, and how do you secure the supply? And then does LNG play a role? We haven’t asked any of those questions. We’re just having a knock-down, drag-out fight without a context. We need a real energy policy. You also need the economic and environmental agencies at the same table. Otherwise, you can’t get anywhere. Randy Gragg, editor of Portland Monthly: OK, we need to wind down. Any final burning questions? I feel like I’ve already been burned enough! Wulff: Of the $10 billion in energy created in Oregon, 85 percent is exported. How do we keep more of that in our borders? How do you feel about nuclear power? My mind is open to modular nuclear power. I need to know more about it. It doesn’t solve the waste storage problem. I don’t know if Harry Reid retires whether Yucca Mountain opens up. But the advantage is, [these reactors] are small and they’ve solved a lot of the safety problems. It’s worth looking at. If you’re going to shut down Boardman, there has to be something to replace it. Peppler: How are you going to bring these disparate groups together, particularly if the Republicans retake the legislature? I would prefer that not happen, having been there once. But I would argue the nature of the problems we face in the next four to six years are so profound that it really doesn’t matter who is in control. Anyone can stop something from happening. There is no partisan solution to any of this. If you can’t reach across the aisle, we are going down the tubes. The biggest power in the governor’s office is the convening power. You need to create a formalized process to regularly get these issues on the table. Peppler: What does Oregon look like after four years of your administration? Hopefully we’ll change the vector. You can’t change all these problems in four years. We’ll have a conversation and agree that we have to fundamentally redesign the way we deliver public services and the way we budget and invest for them with more transparency and accountability. We have decided that we know what a tax system would look like that is equitable and aligned with our economic development strategy. We are down the road to finding an Oregon solution to the medical care crisis, and we’re locked in a fight with the federal government to get the waivers to implement it. And we will have articulated a 20-year strategy to achieve Oregon’s [goals for renewable energy] and the trade-offs we have to make in order to lower our carbon emissions and increase the amount of renewable energy we produce in the state of Oregon.